Most people wouldn't think of preparing a dessert every night but it's nice to treat yourself every now and again. It doesn't matter if you're not into baking as there are plenty of quick ideas that can be prepared in minutes and will soothe any sweet cravings you might have. You might not feel up to the challenge of preparing a main meal and then a dessert as well, but it's simply a matter of choosing two dishes that don't both need hours of preparation and cooking. There are plenty of ideas for great puds that only take a matter of minutes to make and you'll find some inspiration below. This is a good option if you've had quite a heavy meal as it will cleanse the palate. There are no rules for which fruit you should use so just pick some nice seasonal or colourful varieties. A melon salad works well, or a berry combination in the winter. 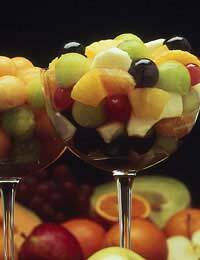 Prepare it in advance, washing and chopping the fruit and placing it in a large bowl. You can then cover it with cling film and keep in the fridge until you're ready to serve. Cream, ice cream or yogurt and honey are good accompaniments. A dessert can be as simple as a bowl of ice cream but it's easy to make it a bit special with a couple of added extras. Try spooning some vanilla ice cream into large wine glasses then adding some finely chopped strawberries, followed by chopped nuts or broken chocolate pieces (just put a chocolate bar in a freezer bag and tap with a rolling pin). This is a real childhood favourite and it couldn't be easier to make. Prepare some custard, from powder, and chop up a couple of bananas. Pour the custard into a shallow serving dish, add the bananas, then place in the fridge to set. Another classic pudding that always gets the seal of approval! You'll need a large, glass serving dish for this. Break up a few slices of Madeira or other sponge cake and place in the bottom of the dish. Make up a sachet of jelly and pour this over the cake. Allow to set. Make up some custard and carefully pour this over the jelly then put the dish in the fridge so the trifle can set. You can sprinkle with chocolate flakes or 'hundreds and thousands' for an extra retro feel. Allow 1 peach per person. Halve the peaches and remove the stones. Place them on a large piece of kitchen foil and sprinkle with a little orange juice. Wrap the foil loosely around them, leaving a small hole at the top for steam to escape. Place on a baking tray and bake in a preheated medium oven for about 20 minutes, until soft. Place them in serving dishes and spoon some mascarpone cheese into each peach half. Top with chopped nuts and a mint leaf. When you get a bit more confident you might like to attempt soufflés, steamed puddings or tarts. If you're organised, it's really not too much more effort to make a dessert, as well.